President Horacio Cartes of Paraguay will visit Israel to discuss several cooperation agreements between the two countries. 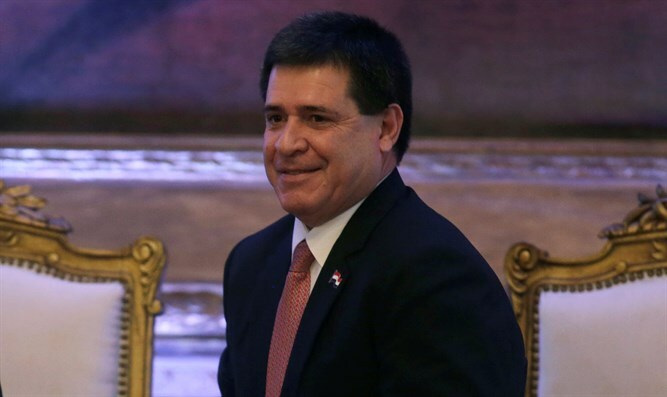 RIO DE JANEIRO (JTA) -- President Horacio Cartes of Paraguay will visit Israel to discuss several cooperation agreements between the two countries. Cartes will meet Prime Minister Benjamin Netanyahu and President Reuven Rivlin during his mid-July visit to talk about bilateral interests in the areas of agriculture, technology and education, the Ultima Hora newspaper reported Monday. "The visit will help us strengthen our cooperation," Israeli Ambassador Peleg Lewi told La Nacion. "We have been doing a lot of work together, which we wish to expand to other areas such as innovation and high technology." Paraguay exports $190 million to Israel annually in soy, beef, charcoal and other products, according to official data from 2015. In Israel, 40 percent of the meat consumed is Paraguayan. Israel is one of the highest paying markets for Paraguayan beef. Last month, Israel delivered drip irrigation systems to Paraguayan small farmers as a result of technical collaboration process with local cooperatives. Two months earlier, Israel had donated food and assistance kits to help Paraguayans displaced by massive flooding in the region, the worst in half a century. The Israeli Embassy in Asuncion was reopened last year after the closure in 2002 along with 15 other diplomatic missions around the world because of budgetary constraints. Paraguay is home to some 1,000 Jews in a population of nearly 6.7 million people.